Historically, a larder was a cool area, usually just away from the kitchen, for storing food prior to use, and were commonplace in houses before the invention of the refrigerator. The essential qualities of a larder in historical times were to be as cool as possible, close to food preparation areas, and equipped with shelves and cupboards appropriate to the food being stored; much like the essential qualities of a larder today! Originally a large, cavernous cold room with a small mesh covered window to keep out any pests, the larder was crammed with epicurean delights: tinned foods, jars of preserved vegetables, dry goods and salted, preserved meats hung on hooks from the ceiling. Over the years, the use of the larder has changed, and decreased rapidly in size since the invention of the refrigerator, and since meals became something we buy, rather than something we make. In recent years however, the classic kitchen larder is something to be desired in kitchens, and is often top of the list of 'must-haves' for our design team, when designing a Burlanes kitchen! Whether it is a simple wall cupboard lined with spice racks, a storage space within an alcove with pull-out drawers, or a beautiful, stand-alone piece of handcrafted furniture, nearly all of the kitchens we design and handmake have a kitchen larder. What would your dream kitchen larder look like? Would you design your larder with pull out vegetable drawers and spice racks, or would you simply want shelving and a big slab of cool marble? At Burlanes, we work with our clients every step of the way, to ensure we create their dream kitchen. Here are a few of our favourite larders we have designed and handmade. Which one is your favourite? Handpainted in Farrow & Ball 'Studio Green', this freestanding larder is simply beautiful. With bespoke oak shelves and spice racks, and a lovely big slab of cool marble and pull out vegetable drawers, it ticks all the boxes of what a larder should be! Click here to see more of this beautiful rustic oasthouse kitchen. Concealed behind two beautiful handmade panelled doors, this kitchen larder opens up to a wonderful array of delicious treats! Adjustable oak shelving means there is always a space for everything, no matter how tall or small, and the two deep drawers on solid runners provide storage space for potatoes and other large vegetables. Click here to see more of this coastal country style kitchen. This 'awkward' space between the back door walkway and the main kitchen door was a perfect space for putting a standalone kitchen larder! All of our furniture is designed and made to measure, so we created this bespoke piece to fit the dimensions of the available space perfectly. The homeowner wanted to integrate the refrigerator within the larder, so that is exactly what we did. With bespoke shelves, spice racks and lovely drop-front drawers for easy access. 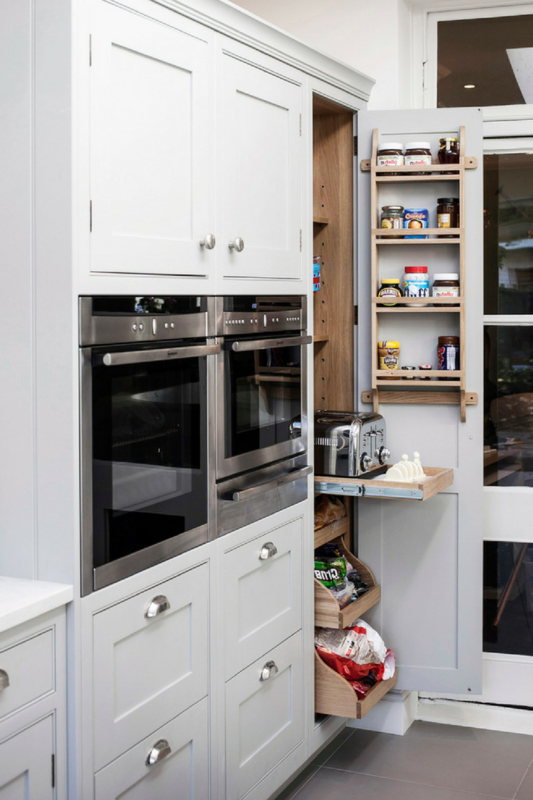 This kitchen extension was designed with a kitchen larder in mind, and we designed and handmade this floor-to-ceiling larder to fit the space perfectly. With spice racks, bespoke shelving and soft close drawers, it really does tick all the boxes of what a larder should be, and we have even incorporated plug sockets for the Magimix and the toaster. Click here to see more of this beautiful kitchen extension. Bi-fold doors are not only beautiful to look at, they are also a great way of opening up a space or cupboard, without being a hazard in the kitchen! Our furniture is just as beautiful on the inside as it is on the outside, so bi-fold doors are a lovely way of showing off the inside of the larder too! 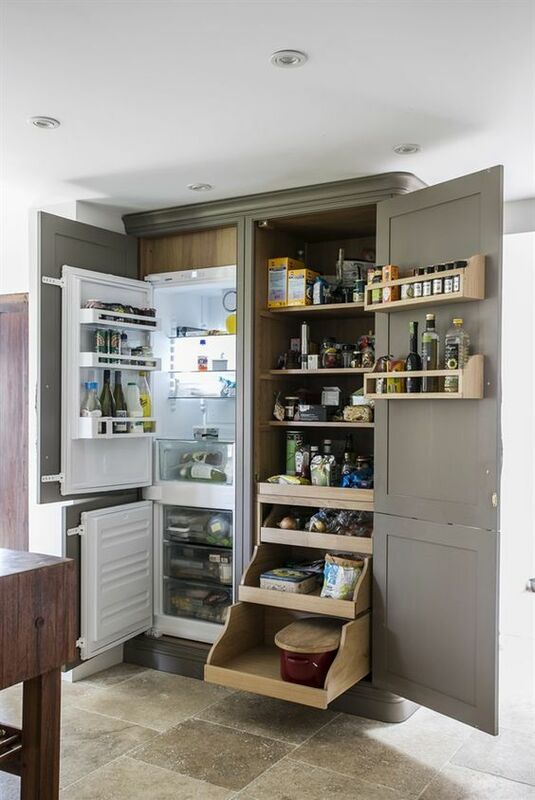 Complete with chiller drawers, this larder provides storage space for dried goods as well as chilled food too, with motion sensor strip lighting. Larders do not have to be overly big, or take up much space at all! We design and create bespoke furniture perfectly suited to the available space, and created this tall, narrow larder cupboard complete with spice racks, adjustable shelving and pull out toaster tray with built-in plug sockets.